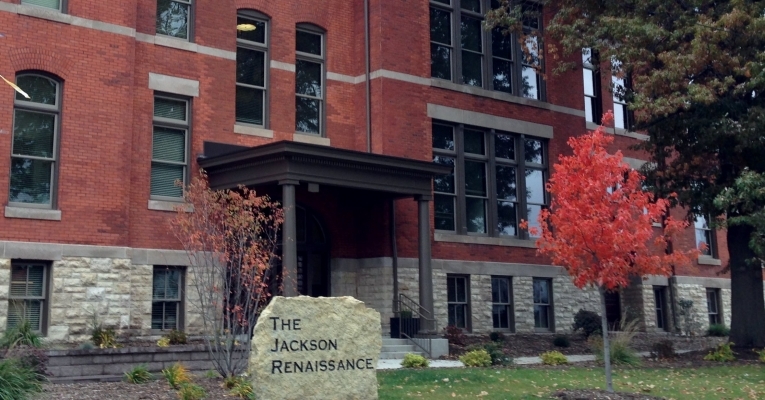 The Jackson Renaissance is the historic rehabilitation and adaptive reuse of the Jackson School Building along with the construction of a new three-story attached wing in Davenport, Iowa, into 48 apartments – 24 in the historic school building and 24 in the connecting new construction. Originally built in 1903, the school closed in the early 1940’s and was utilized as office and other commercial spaces. Forty-four of the 48 residences are targeted to low-income seniors age 55 plus earning at or below 50-60 percent of Area Median Income with four at market rate rents. The gated complex is surrounded by perimeter fencing for enhanced security and features amenities such as a computer room, fitness center and community space. All apartments include full kitchens with a stove, microwave, refrigerator, dishwasher, washer/dryer, central air, high efficiency furnaces and storage. The eco-friendly development saves energy by utilizing geothermal heating and cooling elements and a newly installed irrigation system. Additional features include low-VOC paints and high-efficiency toilets, faucets and showerheads. Chicago-based sponsor Renaissance Realty Group Development is a for-profit developer founded in 1985. National Equity Fund® invested $8.8 million of LIHTC equity in The Jackson Renaissance, its eighth partnership with RRG.